You can now set an email marketing campaign to pre-process only, and never actually send. Just check the box in the Miscellaneous section at the bottom of the Send Email page. There are two steps to processing every campaign in JangoMail: pre-processing and sending. The pre-processing refers to generating a final recipient list, and assigning various email senders to the recipients based on configured rules specific to your account, like whether you're a participant in the Habeas Safelist or the Sender Score Certified programs. In generating the final recipient list, your original recipients are filtered for unsubscribes, bounces, and possibly duplicates. Pre-processing generates the final "send to" list for your campaign. Checking the above checkbox will make it so the "pre-processing" happens, but the actual "sending" never happens. Why would anyone ever want to use this? You may want to see what the final recipient list looks like, after all unsubscribes, bounces, and duplicates have been removed. This feature will allow you to see the final recipient list while not actually sending the email to the recipient list. You may want to see how long JangoMail takes to do the pre-processing, so you can time your actual send in the future accordingly. We have expanded the functionality of the Preview/Save button on the Send Email page to allow sending a personalized preview message to an entire Group that has 100 members or fewer. Additionally, a designated Test Group will have a corresponding one-click "send" button on the Send Email page. 1. To designate a Group to be a Test Group, the Group must have 100 members or fewer, and you must check the box as shown below. Go to the Groups and Email Addresses tab, select the Group, and then click the Change Group Name / Test Group button. 2. Check the box and click the button. Now that the Group is designated a Test Group, go to the Send Email page. In addition to the Preview/Save button, you'll see another button for each Test Group in your account. Clicking one of these buttons will send an immediate test email to the Group indicated on the button. 3. Clicking the Preview/Save button will launch the popup as normal, but a dropdown will appear listing the available Test Groups. After 8 years of the same, boring-beige navigation tabs, we've re-stylized them to look totally Web 2.0! We hope you'll find these new navigation tabs visually and aesthetically pleasing. Tonight we have deployed a bug fix that allows mass email initiations to be sent containing both HTML and Plain Message parts, where the message contains foreign language characters. Prior to the bug fix, when sending a mass email initiation, if the message contained foreign language characters, the campaign would only be sent if the message was sent as a Plain-Text-only or an HTML-only email. If both MIME parts, Plain Text and HTML, were included, then the email campaign would error out. Screenshot of a mass email initiation composed using Outlook Express, and the message contains Chinese characters. Outlook Express will send this with both Plain Text and HTML parts. A mass email initiation is an email campaign triggered from a desktop or other email client outside of JangoMail. For example, you can use Outlook, GMail, or Thunderbird to compose an email campaign, send it to your assigned @init.jangomail.com email address, and then have JangoMail send the campaign to your email list. For more information on this feature, see this tutorial. You can now FTP files to client.jangomail.com/GroupImportsAutoFTP/ and those files will automatically be processed and imported into a JangoMail List. You may use any standard FTP client, such as FileZilla, CuteFTP, or even the FTP built into Internet Explorer. The above screenshot uses the Windows Explorer built-in FTP utility to transfer the file Data.csv to JangoMail. In this example, if an Email List named "Data" already exists, then the email addresses will be imported into this List. Otherwise an Email List named "Data" will be created automatically. FTP to client.jangomail.com using your JangoMail username and password, switch to the GroupImportsAutoFTP folder, and place any data file there. 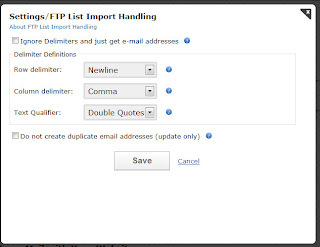 The file can be of any extension (.csv, .dat, .txt, or anything else), and you can set the row delimiter, column delimiter, text qualifier and other options under Settings --> List Management --> FTP List Import Handling. JangoMail will examine your file name, and if a corresponding List exists, then the data in that file will be imported into that List. If a corresponding List does NOT exist, then a new List will be created. The name of the list will be based on the name of the file, but non-alphanumeric characters will be removed. If your file has column names in the first row, those column names will be translated into appropriate List Fields. If your file does NOT have column names in its first row, then field names will be created following this scheme: Field1, Field2, Field3, etc. After the import is complete, you can change these field names to more meaningul names. If your file has column names in the first row, JangoMail will look for a column called "Email" or "Email Address", or similar derivations, such as "E-mail" or "E-mail Address". It will be assumed that this column contains the actual email addresses. If your file does NOT have column names in the first row, JangoMail will look for the first occurence of an email address in your data file, and will assume this is the column containing email addresses. Your file should not have the following field names: confirmed, modified, memberID, uniqueident, submission_date, and email_id. These are JangoMail-reserved words, and files containing these field names may have the fields automatically re-named to something else in the actual JangoMail List that is created, or the file may not process correctly at all, in which case an error email notification will be sent. This feature is foreign language compliant, so you may FTP Unicode files. You may also use a secure FTP client to transfer files. You will receive one email notification when the file is actually detected by JangoMail, and you will receive another email notification when the file is done importing and the data is in your List. If you FTP a file, and that file name corresponds to an existing List, and the file does NOT have column names, the file will NOT be imported, and you will receive an email notifying you of the error. You can now quickly upload a file and have the data converted into a JangoMail Group. The Quick Upload feature is seen immediately after clicking the Groups and Email Addresses tab. If a Group does not exist that corresponds to the name of the file you upload, a new Group will be automatically created for you. 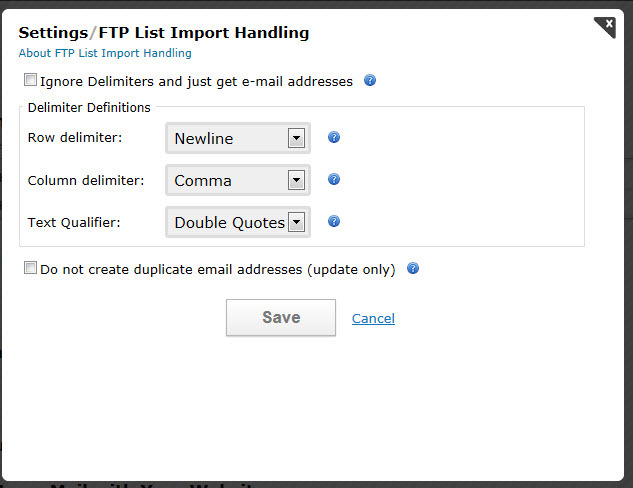 The Quick Upload follows the same rules as the new FTP List Import feature. Need to quickly see which Groups you've recently created? For those clients with lots of Groups, you'll be pleased to know you can now sort your Groups by date, instead of the default alphabetical sort. Just click the "Sort by Date" link at the top of your Group listing. And of course, if you change your mind, you can always toggle back to "Sort by Alphabetical". We've decided to join the social media revolution and join Twitter. Please follow us at http://www.twitter.com/JangoMail. We will strive to make our tweets entertaining, witty, and informative! JangoMail now allows you more precise control over your Email Group Imports. In the Import Wizard, you now can check a box to tell JangoMail to update existing email addresses rather than add duplicate email addresses, if your imported data contains email addresses already present in the Group. This is yet another way JangoMail provides complete control and flexibility over your data. API/Web Service users can call either ImportGroupMembersFromData2 or ImportGroupMembersFromFile2 and set the "UpdateOnly" parameter to "True" or "False". Sends a mass e-mail with a plain text and/or HTML e-mail. Returns a string. Sends a previously saved mass e-mail to a new set of recipients. Returns a string. Sends a mass e-mail, given a raw message including MIME parts and a MIME boundary. Returns a string. Setting Template=True within the Options parameter will mark the email campaign as a Template, and will cause it to appear in the "My Templates" dropdown menu in the Send Email section of the JangoMail web interface. 1. Define Field: Make sure that your JangoMail Group has a field defined to store a person's date of birth. In the below screenshot, the field is called DOB. 2. Set DOB values: Make sure your Group members have a "DOB" value set. Use a standard mm/dd/yy format, as shown below. 3. Compose birthday email: Next, setup the email message that you wish to be sent on a person's birthday. Do this under the "Send Email" tab. 4. Schedule and send: Finally, re-select the message you composed in step 2, put in the scheduling parameters, and hit Send. The scheduling parameters are set to send the email daily, at 3:01 PM, and a box is checked to re-query the Group every day, ensuring that every day, the email is sent to that day's birthdays, rather than the birthdays from the day we scheduled the email.